Happy New Year! Welcome to twenty-sixteen and the first of the monthly blog challenges from Liz. I have to say, 2015 ended with a whirlwind of activity here at Scrapping with Liz. It was a little bumpy but I'm happy say that the team seems to be settling in to our new digs at The Lily Pad. 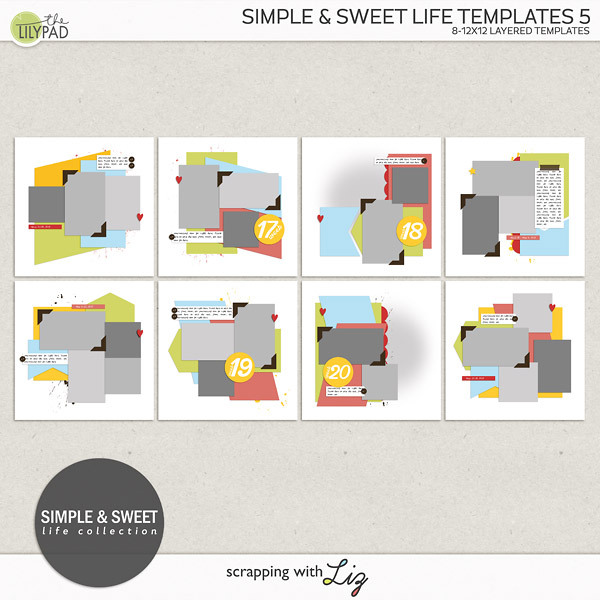 Liz is busy rebranding the templates you know and love while creating even more yumminess for you to scrap. The team is exploring the new site while discovering new kit designers and seems really excited to be branching out. It's been a bitter sweet change for most of us but like any other move from one home to another, I'm confident we'll all adjust. I'll start this year like I do most and tell you how the monthly blog challenge works. 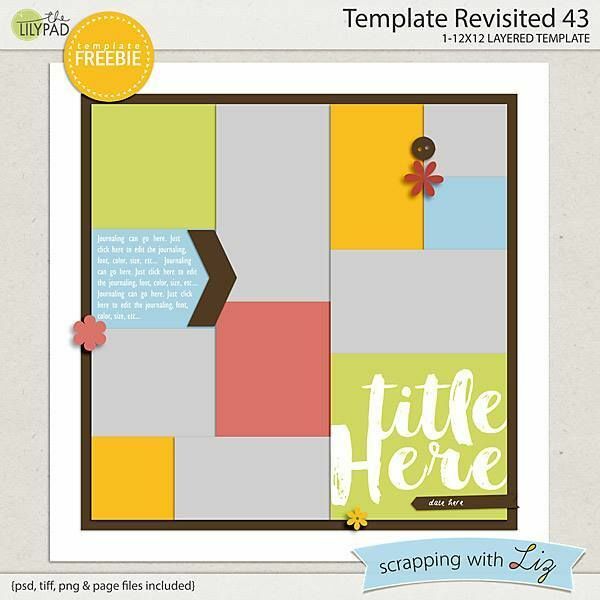 On the first Tuesday of each month, I post a free template from our fabulous Liz. The challenge is to download and scrap a layout using that template before 11:59 pm (Pacific) on the last day of the month. You may use any kit(s) from any source and may upload your layout at any image hosting site you'd like, just leave a link in the comments section of this post so we can see what gorgeousness you created. We'll use Rafflecopter to choose our random winner and send out the prizes. Yes, prizes! One lucky scrapper will receive a $5 coupon to Liz's store at The Lily Pad. Everyone else receives a coupon good for 35% off. Pretty sweet if you ask me: a free template aaaand a chance at a free template pack of your choosing from the store! So let's get to that! Drumroll please..... The first blog challenge template of 2016 is Template Revisited 43! 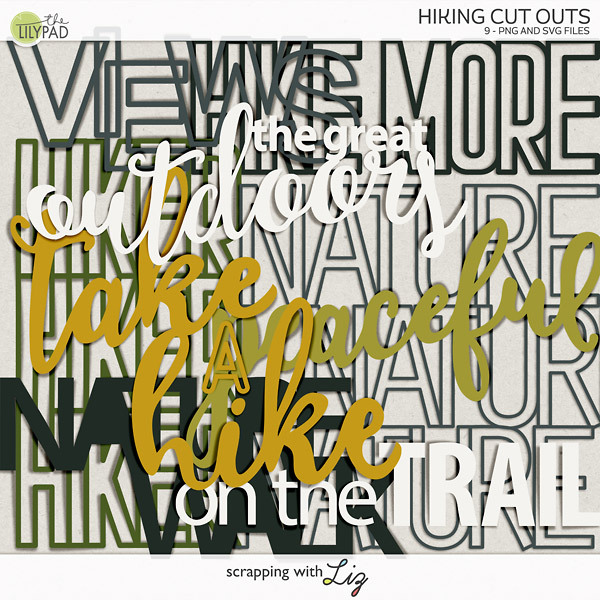 Each month the team offers up a couple of layouts using the template for inspiration. This month we have layouts from Donna, Ekaterina, and me. We hope you like them and that they stimulate your creativity. Remember, this is an easy-peasy challenge: 1) Download the template 2) Scrap it! 3) Upload it to your favorite image gallery 4) Leave a link to your page in the comments section below and 5) Enter the Rafflecopter Giveaway. TO ENTER THE RAFFLECOPTER GIVEAWAY CLICK HERE! For those of you who've been playing along with me for the last couple of years, thank you! I really enjoy seeing what you guys do with Liz's templates. If you don't mind, when you add your layout link, tell me how many times you entered in 2015. And you can take the survey here to tell me which one was your favorite! Personally, I don't know if I could choose just one of these as my favorite for the year. I do know that I'm looking forward to seeing what's in store for 2016. Okay, enough nostalgia! As always, I'll announce the winner for last month's challenge. Coupons are sent to the email registered in Rafflecopter. Winners are selected randomly. Our winner for the December 2015 Blog Challenge is Nertha G! Congratulations, Nertha. I'll send out prize coupons to all of those entered in the next 7 - 10 days. 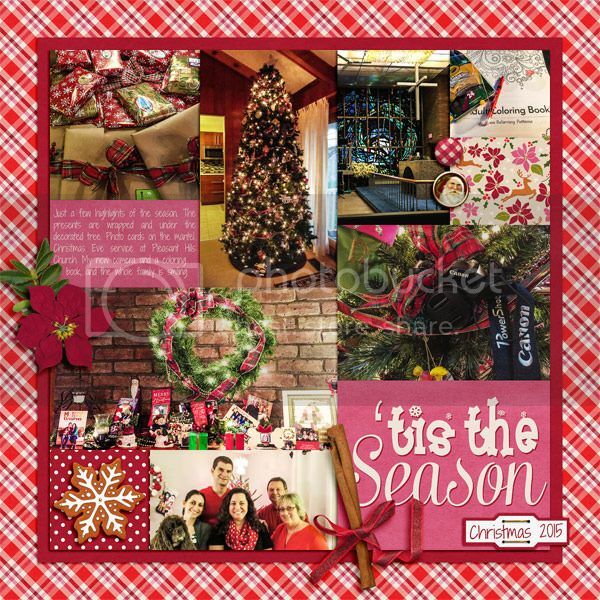 Come back to this blog post and leave a comment with a link to your completed layout by 11:59 pm (Pacific) on January 31, 2016 AND enter the Rafflecopter giveaway for your chance to win. Winners must provide a layout link in the comments section AND enter supply an email address in the Rafflecopter survey. We never share your information. Winner of the $5 coupon will be chosen and announced the first Tuesday in February 2016! Non-winning participants will receive a participation prize so remember to leave us a way to reach you when you link your layouts. Don't forget to watch your coupon expiration dates! Maybe it is just me, but doesn't matter where I click, I cannot trigger the download. Is there a way you can put an additional link? I am on a MacOS, if that makes any difference. This is the direct download link. Thank you for the awesome template!! And thanks, Rebecca, for the direct link! Love this template! I'm going to try to play everything month in 2016! Love the template. Thanks so much. Finished my page and posted it in the Lilypad Gallery. Thank you so much for the fantastic template!! I had to rotate it. I posted my new email on rafflecopter: shellywebster(at)freenet(dot)de. Thank you for the fun challenge. Here is the link to my layout! Thanks so much for the template. I flipped it and altered it a little. Thanks for the template and the challenge!